The Data Inspector allows you to view data in any FME-supported format. Note: The easiest way to view data is to start the FME Data Inspector and drag a file onto the main window. The Select Dataset to View dialog will appear with the Reader format and dataset fields already filled in. Click OK to load the data in the View window. Click the Open Dataset icon or select File > Open Dataset. This opens the Select Dataset to View dialog. Specify the format of the file you want to read by clicking the browse button to display the Reader Gallery. After you have viewed multiple datasets, the Format drop-down box will show the 10 most recently used formats. Once you have selected the desired format, you must specify the data file to view. Begin by clicking the Dataset Browse button . This will launch a file browser (notice that only files of your selected data format are visible). Browse to the appropriate data file(s) and click Open. Alternatively, for formats requiring multiple files or folders, click the Advanced Browser button . Tip: FME can usually detect the format of a selected dataset. Therefore, it can be faster, especially if you aren't sure which format the dataset is in, to select the dataset first. Because the format field retains previously viewed formats, you should confirm that the format field is correct before you attempt to view the data. If the format does not match the dataset, the data will fail to load in the Data Inspector. You can connect to a URL or a supported web service to access the dataset to read. From the Dataset pull-down menu, choose Select File From Web. To select a dataset directly from a URL, choose Specify URL. In the Dataset field, complete the URL to the dataset. To select a dataset from a supported web service, specify Browse and the web service to connect to locate the file. In the Select file dialog, you can specify an existing web connection, or create one and use it right away. For more information, see Using Web Connections. Under Choose File, select one or more data files. Depending on the web service, you can apply a search filter or specify a path or folder to locate files. When finished, click OK. The Parameters button allows you to specify additional information required by certain source formats. When you select a format that permits additional settings, the Parameters button will become available. The Parameters box contains options specific to the format you selected. For detailed help with format parameters, click the help button in a parameters box , or press the F1 key. Note: If a format supports reader parameters, you do not necessarily have to change them - FME will simply use default values. In rare cases, you may be prompted by FME to open the parameters to confirm that these default values are appropriate. In most cases, the Coord. System field indicates Read from source after you have chosen the format and dataset. This means that FME can detect both the source dataset and the coordinate system that is being used. Recently-used coordinate systems are also saved in the Coordinate System drop-down menu. 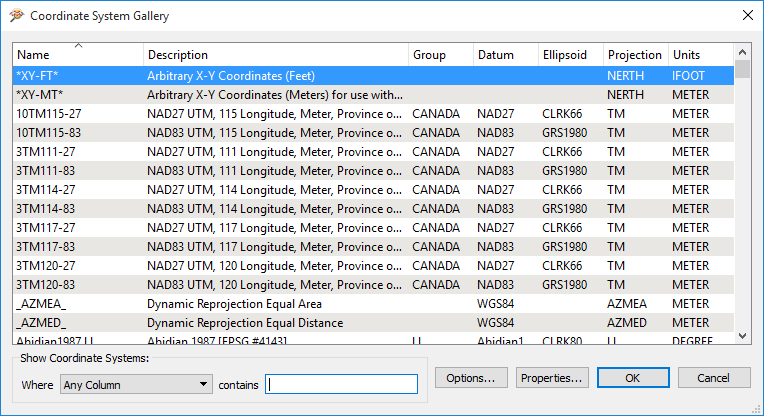 Tip: For more information on individual coordinate systems, select a name in the Coordinate System Gallery and click the Properties button.